Martin Heckscher, Vienna; Christie's London, 4-6 May 1898, lot 54 (£800 to Goldschmidt). 1913 Bath House Inventory, p. 131, no. 652, in the safe. 1914 Wernher Inventory, p. 87, no. 436. A nearly identical house mark is recorded on a painted panel of the Goldsmiths' Guild in the Ulm Museum. This house mark, incorporating the initials 'IS' beneath, was that of Joss Meyer, who became a master in 1582. It is possible that a variation of that mark was used by other members of the large Meyer family of goldsmiths in Ulm in the early seventeenth century, such as Uriel, Samuel, or Lorenz Meyer. A recent listing of some thirty recorded nautilus cups with maritime themes includes two with the image of Jonah and the whale (H.U. Mette, Der Nautiluspokal, Munich, 1995, p. 139). The superb cover on this example can be compared with an example at the Wadsworth Atheneum, Hartford, Ct. (E.A. Jones, Catalogue of the Gutmann Collection of Plate, now the Property of J. Pierpont Morgan, Esquire, London, 1907, pl. XXV). 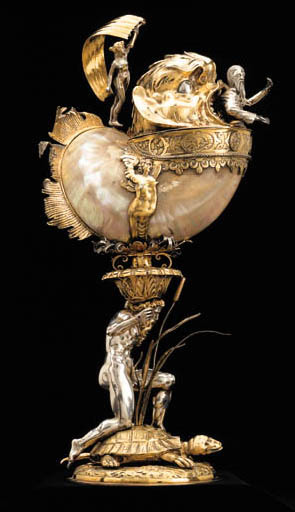 The second nautilus cited by Mette is surmounted by a large figure of Fortuna and the valve of the shell is capped by the whale, with a small Jonah between his jaws and ridden by an infant triton. This was marked by Matthaüs Wallbaum, Augsburg, circa 1613-1615 (Mette, loc. cit., and illustrated in H. Seling, Die Kunst der Augsburger Goldschmiede, 1529-1868, Munich, 1980, II, fig. 101). A figure of Jonah in the whale's jaws is also found on a nautilus cup hallmarked in London in 1557, and not listed by Mette (Christie's, London, 12 December 1983, lot 198). On this cup the whale emerges from the back strap of the shell and his jaws enclose a small kneeling figure of Jonah in prayer. The striking turtle base is also found on an unmarked English or Flemish turbo shell cup of circa 1585, which is close to engraved designs by Antwerp engravers such as Erasmus Hornick and Cornelis Floris (T. Schroder, The Gilbert Collection of Gold and Silver, Recent Additions, Los Angeles, 1988, no. A). Turtles remained enduring features of such cups and are found on nautilus cups from the sixteenth until the early eighteenth century. (We are grateful to Professor E.L. Richter for his suggested identification of the maker's mark).